A father hunted over the alleged killing his wife and their 10-year-old daughter with a machete has been arrested in Florida. Police were hunting Noel Chambers who police said attacked three members of his family, leaving his wife and young child dead and his older daughter in a critical condition. 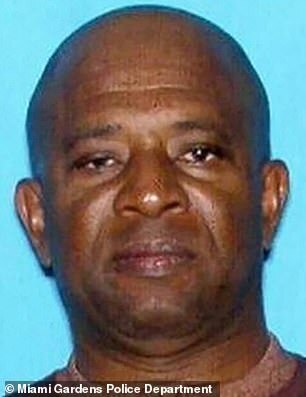 His wife Lorrice Harris was found dead on the back porch of their South Florida apartment and his young daughter, Shayla Chambers, was discovered inside. A second adult daughter, named locally as Shanalee Chambers, was found outside the apartment suffering multiple wounds, Miami Gardens Police said. The 57-year-old was found on Tuesday night outside a fire house near Miami after firefighters arriving at the station from a call recognised the suspect and called police. Carlos Austin, a department spokesman, told ABC News: ‘Miami Gardens Police Department directed all of our resources to ensure that we took Mr Chambers into custody.